WIFI not working – Getting connected wirelessly from laptop to the internet is something common in the busy world today. We do not realize or do not care with its existence until we found that our WIFI is not working anymore as it used to be. This seems a little problem but actually, it's a big problem because you cannot finish most of your jobs like replying email to your client, sending a report to your boss, video conference and more. How to fix WIFI not working problem? Before thinking too far, check your WIFI whether it turns off or on. I found this case quite often in the office, people turn off their WIFI and forget to turn back on. Depend on your laptop model/type. In the older type, there is a small switch on the right side or left side of the laptop. Turn the switch on, usually, the indicator lamp also will lit, or will turn from orange to blue or green. On the newer model, you will see the switch just above your keyboard, on the right side. This switch usually also can be turned on by pressing FN key + F2 key or F2 key only depend on your manufacturer. WIFI can be disabled accidentally because only need one click to disabled or enabled. To check the status of WIFI, click start, control panel, network and sharing center, change adapter settings. You will see some network adapter at least 2 network cards. Local Area Network and Wireless Network Connection. On the wireless network connection, right click, you will see a similar picture as below. If you see Disable, then your current status is enabled and vice versa. Make sure you see Disable, if not click Enable to make it work. Access point, modem and router in the company usually working 24×7. With this condition sometimes they need to be restarted to refresh all memory and make it works again. You need to turn off the device for 1 minute and turn back on to reset all the memory in the device. The easiest way to restart is by plug off the cable power and plug in again. After restarted some router need about 10 minutes to back online. You may will need to re-start your computer as well. Sometimes I found that WIFI is not working because it has a different IP address than it should be. This can happen when someone has changed the IP address manually and never put it back to the previous IP configuration. 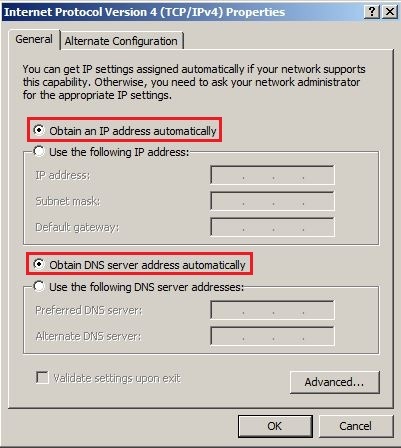 To fix the problem: Go to network and sharing center>Change adapter settings Right click Wireless network connection, click properties, double click internet protocol version 4 (TCP/IP v4), choose to obtain an IP address automatically, and choose to Obtain DNS server address automatically. Click OK button 2 times. Now you should get the correct address and your WIFI should working. If you are working in the office complex, you should see many WIFI in your neighbourhood. 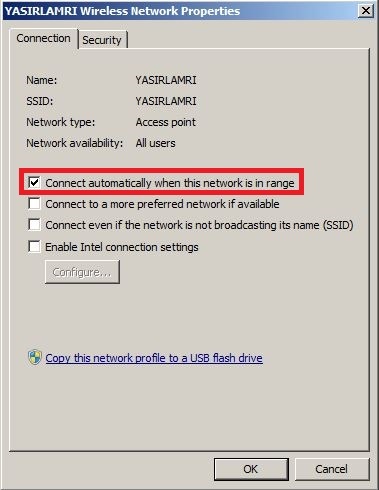 If your computer automatically connected to the network that is not belong to you then you will not able to connect to your network. 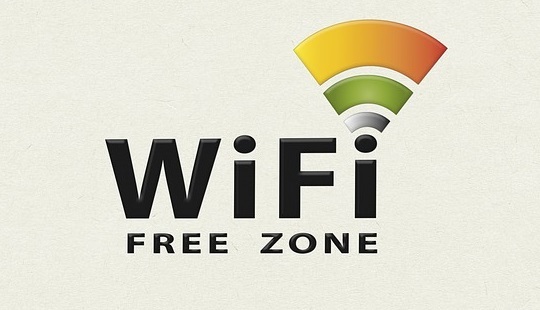 To solve this problem, you should choose to connect manually to other WIFI SSID and to choose automatically connect to your WIFI network. Open manage wireless network (click start>control panel>network and sharing centre>manage wireless network). 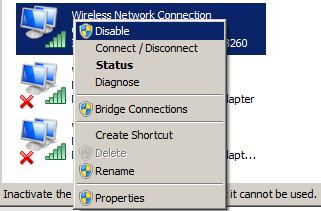 As you can see on the picture above that some SSID/Network configured to be Automatically connect or manually connect. If your neighbour network configured to connect automatically change it to manually connect. Double click the SSID name you want to change and un-check the Connect automatically when this network is in range option. 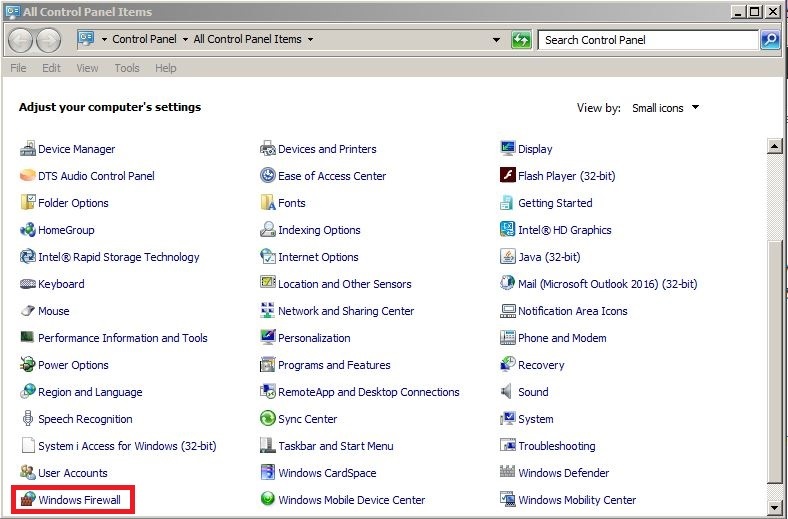 Windows firewall or other firewall program sometimes can block ports , make sure you turn it off first and see if you can connect. 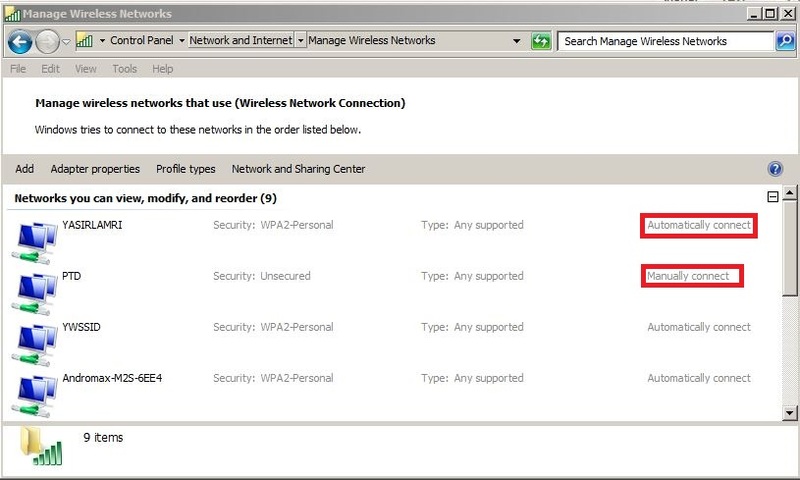 If you can connect to WIFI/Internet after windows firewall being turned off, you should inform your administrator to check if this comply with company policy. If after check all above and your WIFI still not working, then your WIFI hardware could be broken. If this is happened, you can use network cable to connect to the internet. To order the original part of WIFI could be long process and takes time. If you need in hurry you can buy USB WIFI to replace your build in WIFI card. If we already did all WIFI troubleshooting above and still have problem, and you are not the only one who cannot connect to WIFI. Let your administrator know, you will not able to fix this from your laptop alone. Sometimes this happen on the internet provider company, your administrator should chase them to solve the problem as soon as possible. I hope that you can found and fixed your WIFI not working issue by following 8 tips above, if you find something new add in the comment and I will add to the list after I check. You can also check following great website for alternatives solution on WIFI not working issue.